In this post, we will be discussing about some of most interesting iPad applications which were released recently or have seen a major upgrade in the last 3 months. Most of these apps are free. So do not forget to download and enjoy. 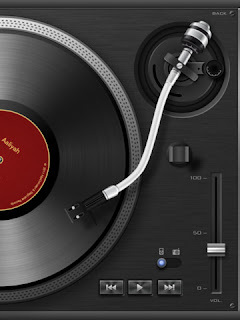 If you like music and retro style Hi-Fi systems you are going to love these apps. Beat Blaster is designed specifically for iPad running iOS 5 and above, to play your iTunes music collection in a completely new way. But this is much more than a media player with an interesting look; BeatBlaster. There are many people that still make use of a traditional Hi-Fi these days, but by popping your iPad into a dock and hooking it up to a set of speakers. BeatBlaster provides the Hi-Fi look and control in iPad itself and using its Airplay feature you can hear the music in your home Theatre speakers provided you have invested in one of the latest AVRs, most of them supports Apple Airplay. It can be used to listen to your iTunes music or radios or locally stored music files. The Hi-Fi player view: The main view of the app is that of a Hi-Fi, complete with a graphic equalizer, basic playback controls and links to other aspects of the app. For many people, watching the bounce of a graphic equalizer was a great accompaniment to listening to music. Speaker View: In this mode you can watch a pair of speaker cones pumping. The Library view: In this mode you can see your collection of albums and you can access to web radio stations. Remote for BeatBlaster is available as separate free apps for iPhone. If you are music fan wants to peep into a live performance from any famous artists, you can do just that via the new NPR Music app for your iPad. 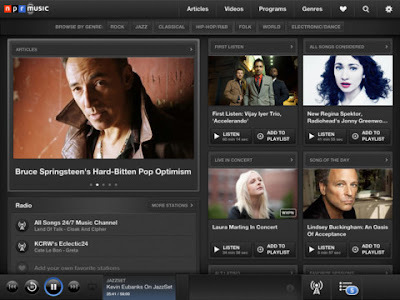 It lets you listen not alone to live performances, but advance album and live streaming radio content. It is free so I recommend downloading it and fiddling with it to learn more. I have not seen a better way of browsing through YouTube Videos or Facebook videos. Showyou offers a grid-like view for browsing the videos on social networks like Facebook, Twitter, Tumblr, YouTube and Vimeo. 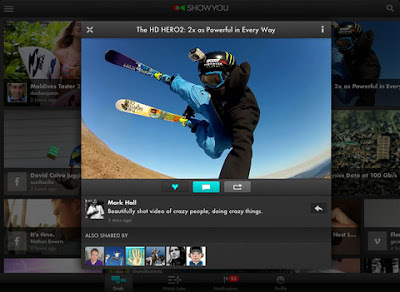 Once connected, you can watch any of the over 30 million videos indexed by the Showyou search engine. Browsing through the videos is very easy and looks seamless. Indexing is very fast and grouped into different categories for easy navigation. ShowYou supports AirPlay, so iPad couple with Apple TV gives an excellent way of watching videos in large screen TV. For those who are not familiar with Airplay I like to mention that it is the best way of playing any video/ Audio wirelessly. It just works unlike DLNA. 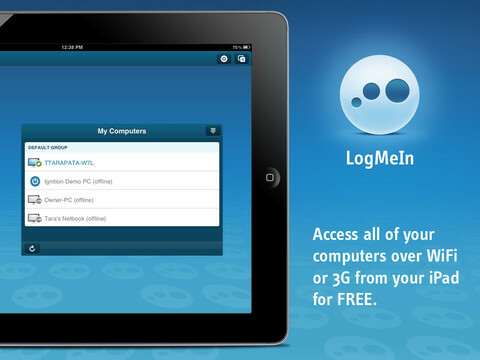 Using LogMeIn you can control your PC or Mac directly from your mobile device, iOS devices or Android Phones. Wherever you have Wi-Fi or 3G, you can remotely control your computer as if you were sitting right in front of it. This is one the essential applications we should have which enables you to access application as well as data in your home computer while on travel. With full access to your remote computer you can use your PC/Mac applications from your iPad/iPhone wherever you go even proprietary business applications. The free application LogMeIn can do the first 2 functions listed below and has security layer built into it which may be good enough for most of the users. You can use your remote machines access credentials to log into the machine, if it does not have a user id and password to log in you need to create a code to access the machine when you initially setting it up for remote access. Initial setup is very simple. To use functions 3, 4 and 5 you need LogMeIn Ignition and with Ignition you can do much more things. 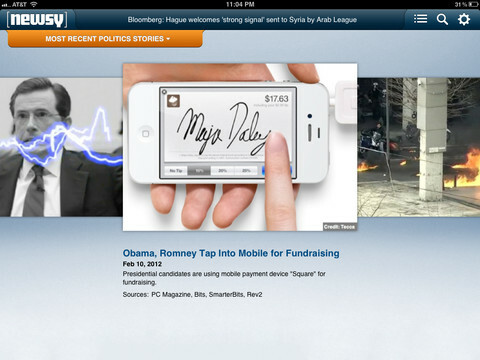 There are many aggregators of video news clips. But Newsy is little different, it actually has an editorial staff making decisions on content. There are stories ranging from national news to sports and each one is introduced by a Newsy anchor and comes up with video clips from at least three sources. The stories generally last between two and three minutes. It is generally interesting to watch and the anchors looks refreshing. All of us know the popularity of Internet killed the reading habits of many. We all stopped reading but started browsing; jumping from one site to another, our attentions span is very limited and joy of reading is sadly missing. 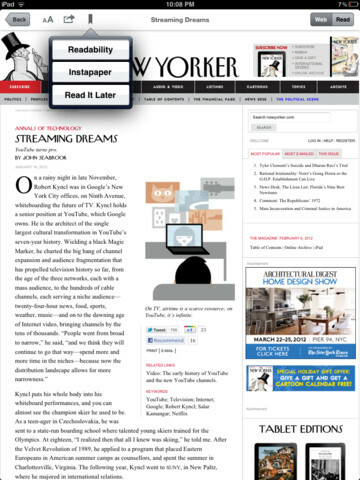 But if you still crave for reading long nice articles in your iPad look nowhere else but install LongForm today. It brings you in-depth articles from well-known magazine around the world which reminds you of Readers Digest till 80s. These articles are handpicked by editors of Logform.Org and are available for offline reading. I am sure that you will find many articles which are refreshing to your mind and soul. Skitch is from the creators of Evernote the famed notes apps across platforms and one of the excellent apps for iOS devices too. Skitch use shapes, arrows, sketches and text annotation to get your point across fast. You can markup photos, screenshots, maps, and webpages then share them with anyone you like. I think Skitch live up to reputation of Evernote. 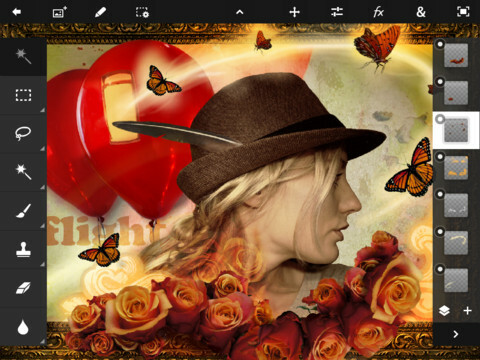 Photoshop Touch is Photoshop apps, the popular image editing software brought to iPad Adobe systems. 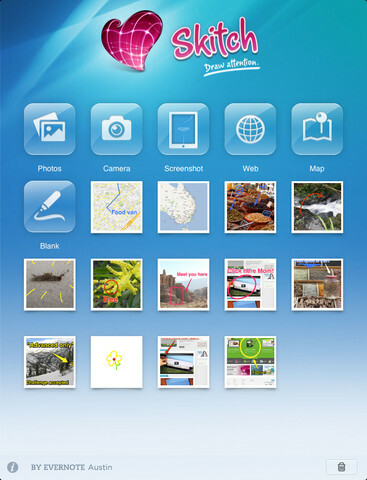 This is one of the applications which change the image of iPad from content consumption to content creation. It has got most of the tradition features of Photoshop and in additional to sharing your work on social networking sites directly. This is Word Game but different from Scrabble. W.E.L.D.E.R. is a self-contained strategic word game with links to social media. On an eight-by-eight tile board of jumbled letters, players must swap tiles to create words of at least four letters. 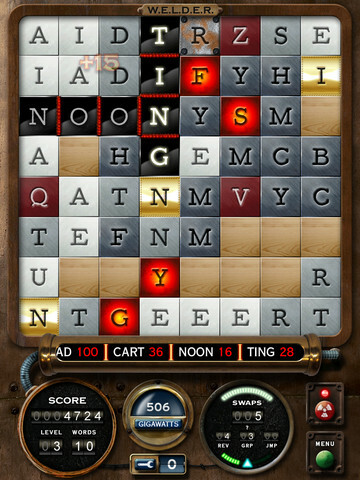 When a word is formed, those letters are replaced and the player earns points. Players must earn a certain number of points without using all of their allocated tile swaps to progress to the next level. Some tiles have special characteristics, so the game involves an element of strategy; it is not timed. Players can look up the definitions of any formed words, including unfamiliar words identified by the game. Overall it is a great game with good educational values. 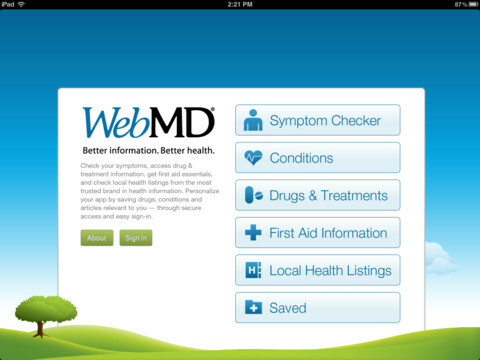 If you are suffering from flu like symptoms and not sure of what it is, WebMD iPad apps become handy. It will ask probing questions to give you some clues about what may be bothering you. WebMD is a public internet site which is known for hosting health related information, including symptom check list and pharmacy information. A WebMD iPad application brings this information to iPad in an organized manner. Drugs & Treatments – Search our extensive database for information on Drugs, Supplements, and Vitamins. Access content such as Uses, Side Effects, Warnings, and more. Pill Identification Tool – Identify your prescription drugs and over the counter medicines by pill shape, color, & imprint. 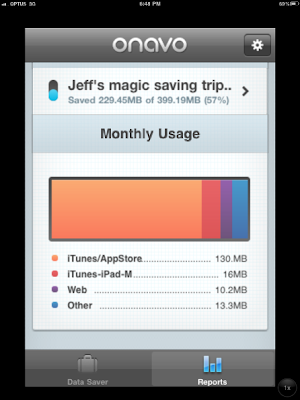 Onavo claims that it saves money on 3G data charges by compressing it. I have used it for some time to get mixed results but I think the carrier found out and refused connection to 3G after 3 weeks and I had to remove it to regain the data connection. I am not sure of it since I did not re install to verify it. I like to mention that the iPad’s top application Flipboard has gone through another make over recently adding cover stories which still retains the No 1 slot.